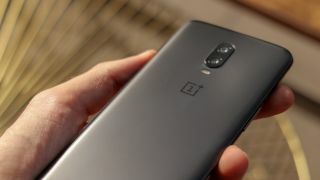 The OnePlus 7 definitely makes the cut for one of our most anticipated phones of 2019, but aside from a potential sighting in the hand of OnePlus CEO Pete Lau we haven’t yet seen any leaks of what the flagship handset might look like… until now. First posted on Slash Leaks – which has a better-than-average record at getting leaked images ahead of time – the image that purportedly shows the OnePlus 7 gives us a look at the top of what appears to be a new phone prototype in its packaging. We’ve got some ultra-slim bezels here, and no notch at all on the front of the phone on the left: is this the OnePlus 7? There also seems to be space up at the top of the casing of the phone, potentially for a slide-out front-facing camera. Unless OnePlus has managed to embed the camera and the forward-facing sensors under the display, this is pretty much the only other option for the phone on the left. We don’t have a whole lot else to report about the OnePlus 7 at the moment, but if it follows the release schedule of the OnePlus 6, then we can expect to see it sometime in May. A OnePlus 7T handset could then potentially follow later in the year. OnePlus has already confirmed that the phone is going to carry the flagship Snapdragon 855 processor from Qualcomm, which should mean plenty of power under the hood without too much of a hit on battery life. The phone should come with plenty of RAM included too, if OnePlus remains true to form. What’s still up in the air is whether the phone is going to include any 5G technology. OnePlus definitely has a 5G phone on the way for this year, but it might not be the OnePlus 7. We might even see a 5G and a non-5G version of the OnePlus 7 go on sale.